In early February, a survey was mailed to 1,120 Local 340 members who work under the Inside Wireman’s Agreement to fill out and send back with suggestions as to what was important to you regarding your Collective Bargaining Agreement. We received less than 90 responses, but I assure you that every one of these responses was reviewed by your Negotiations Committee and considered when we entered into Inside Wireman negotiations with Management. After many hours of negotiations, Labor and Management agreed to a final proposal on March 28th that both sides felt was not only solid for our membership but good for the future of work in our jurisdiction. We then sent out another mailing to all Inside members announcing a Special Called Meeting for Discussion and Vote on this final proposal. Again, less than 90 members attended the Special Called Meeting on April 29th and the final proposal failed to ratify by the members in attendance. following the meeting, lead me to believe that the most overwhelming concerns were the length of the agreement (members wanted it back to a 3 year agreement instead of a 4 year agreement) and most importantly, the lack of movement of the starting apprentice rates. The Negotiations Committee was in concurrence that the negotiated contract, along with new input from the members would serve as a strong platform for the next steps. Due to time contraints, on the Monday after the meeting, May 1st, we filed for the earliest CIR (Council on Industrial Relations) ratification to be used only if we were unable to come to an agreement at an Interim Negotiations Meeting that week. We took your reasons for failing to ratify the final proposal back to the table at that Interim Negotiations Meeting on May 3rd, but unfortunately, was unable to come to any further adjustments to the Agreement. I attended the May 8th CIR Session in Washington DC and was given the opportunity to address the concerns of our membership about the final negotiated proposal. The CIR Decision was received a week later and I am happy to report the Council of Industrial Relations did listen to some of my arguments and they did not agree to the final proposal as it stood after negotiations. Their standing was to increase our apprentice rates/wages from 32% & 37% to 35% & 40% effective June 1, 2017. This will favorably impact over 35 Local 340 apprentices. I want to thank every single one of those members who took the time to fill out the surveys and those who gave up their Saturday morning to attend the Special Called Meeting for Discussion and Vote. No matter how you voted, I appreciate your participation in your Union. As a new Business Manager, these Inside negotiations were quite an educational process for me. I now have a much better understanding of the whole process from the start of negotiations, all the way to DC, if necessary. Your Negotiations Team, Executive Board and myself stand by this new Inside Agreement and consider it to be a very good one for the Local members and the Industry at this time. 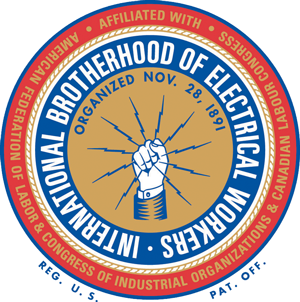 If you have any questions or concerns, please feel free to contact me at bward@ibewlocal340.org. We are getting into the smaller parades! Since the St. Patrick’s Day Parade was so well received by the members and their families, we decided to once again march in another parade. On Tuesday July 4th, we will be participating in the 16th Annual Spirit of Freedom 4th of July Parade in the Arden Arcade Area. We have close to 200 members living in that area and hope that you (and every member, no matter where you live) will come join us. Decorated Motorcycles / Bicycles are included, so if you want to decorate your “ride” and maybe win a prize, or if you and your family members just want to join us in this short 1.4 mile walk, please contact us. We will be ordering materials for our members to give out to the parade watchers and then we will be feeding everyone after the parade at Howe Avenue Park. Please call our Secretary Lindsey Gonzales at 916-927-4239 for more information and to sign up! Also, if you live in an area where you feel IBEW community exposure would be welcome, let us know. We are interested in participating in events in some of the smaller communities to let them know Local 340 members live and work and go to school in their areas. We want to get our name out there in a positive way and who doesn’t like a parade? 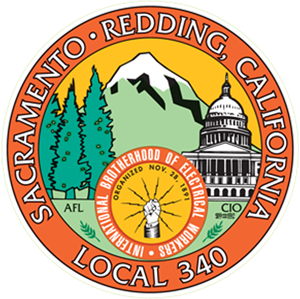 Saturday July 15th is Local 340’s day to man the Union Booth at the California State Fair. Be sure to stop by the Union Booth for your “freebies” and introduce yourself to the Brothers and Sisters who are volunteering their time to get our message out. Tickets are now available for the annual Sportsman’s Club Raffle. Prizes are: Henry Rifle, Rod & Reel, Shotgun and much, much more. Drawing will be held at the September 6th membership meeting. Tickets are $5.00 each or 5 for $20.00. Purchase them at the Union Meetings, at the Business Office or from a member of the Sportsman’s Club. THE BASKETBALL GAME AT GOLDEN ONE ARENA IS ON! THE 340 SPARKEEZ ARE PLAYING AT Golden One Arena on Saturday June 17th AND it is free to all! The date and time have been confirmed! Local 340’s Basketball team the “The 340 Sparkeez” will be playing Plumbers Union Local 447 “The Pipers” on Saturday June 17th from 3-5 PM at the New Golden One Arena. Entry into this game and a chance to tour the new facility is all free to you and your family members. Look for the flier in this Labor Bulletin, as well as in your mail. Please come to the Game…we want a big showing of Local 340 members and families cheering on our new basketball team. Can’t have less fans than the Plumbers! Remember to mark your calendars for Saturday September 16th for this annual membership picnic in Elk Grove. Fliers will be mailed within the next month or so. Also, if you can help, the areas that volunteers are needed are in registration, food serving, Bingo games and Kids booths and games, not to mention setup and teardown. We have reached out to Local 340’s Women’s Group, Renew Group as well as the 5th year graduating class but we typically need 85-90 volunteers from start to finish to make this picnic a good one for you and all of our members and their families. If you are interested in attending and getting more involved this year, please call Reyna or email her at rkwong@ibewlocal340.org. If you were unable to attend the Special Called Meeting on Saturday April 29th for Discussion & Vote on the negotiations for the Inside Wireman’s Agreement, come to the membership meeting on May 3rd for the results of that vote. 340’s New Basketball Team Playing at Golden One Arena! Looking like June for this game, but the Golden One Center still has not confirmed an actual date in June so continue to stay tuned! According to team manager Brendan Nelson, however, the “340 SPARKEEZ” are definitely ready to beat Plumbers Union Local 447 at the new Arena. Reyna or email her at rkwong@ibewlocal340.org. Your help is needed and welcomed. Help Stamp Out Hunger! The annual Letter Carriers’ Food Drive is Saturday May 13, 2017. Put your non-perishable donations in a bag by your mailbox. The mailman will take it from there. Food donations can also be dropped off at the Hall. We will make sure they are delivered to the Food Drive. Brother Bruce Craighton – 17 year member / 66 years of age passed away suddenly from a fatal heart attack.